I recently wrote a review of the JoLida JD-302B Integrated amplifier. In that review, my main complaint on the performance of the amplifier was a lack of the deep controlled bass that I had become accustomed after listening to high powered solid state separates over the last ten years or so. Michael Allen, President of JoLida, suggested that I may prefer the performance of the "big brother" to the JD-302B, and sent me a JD-502B for evaluation. For those of you who have read my review of the JD-302B, you may notice that both amplifiers appear to be identical. In fact, they are both extremely similar, sharing the same chassis, transformers, and input and driver tubes. It occurred to me after posting my review of the JD-302B that the amplifier (and thus the 502B) shares a strong cosmetic likeness to a much more expensive amplifier, the Conrad-Johnson MV-55 power amp. In fact, the amplifiers look (and sound) far more expensive than the actually are. Even the rear panels on both amplifiers are a surprise: speaker output binding posts are not the cheap red and black variety normally associated with gear in this price range, rather they are very sturdy gold plated binding posts. The main difference between the JD-302B and the JD-502B are the output tubes: the former uses EL34's, while the latter uses 6550's or as an alternate, KT88's. Although the JD-502B ships only with a quartet of 6550's, I had the opportunity to listen to the JD-502B with both types of output tubes. Additionally, the output tube adjustment potentiometers are of different values in the two amplifiers, to compensate for the differences between the EL34 tube and the 6550 or KT88. The JD-502B is rated at 60 watts per channel, compared to 50 watts per channel for the JD-302B. While conventional wisdom would lead one to believe that the extra 10 watts per channel are negligible, don't believe it. The extra 10 watts per channel made the 502B sound much more robust in comparison to its little brother. It also seemed to play considerably louder in absolute terms, when necessary. 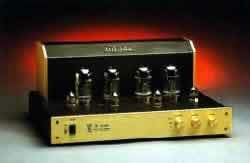 I first auditioned the JD-502B with a quartet of KT88 output tubes. I really like these tubes! These tubes seem to give everything: deep bass, excellent pace and rhythm and excellent tonal purity. In fact, I thought on many occasions " This is perfect!" I really had a hard time finding something to fault with the sound. Music just seemed to flow into the room with certain ease. I really like that the JD-502B gives the end user the capability to choose between KT88's and 6550's. But most things Hi Fi come at the expense of another: Want high power? No problem. Just trade a bit of clarity. When looking at speakers, do you want high sensitivity? No problem. Just give up some power handling capability. This axiom proved to be true, alas, with the KT88's. The '88's, it turns out are fragile tubes, and are often damaged in shipping. On two occasions, I experienced failure of KT88's. The upside of this is that I experienced firsthand the durability and reliability of the JD-502B: nothing major or catastrophic, just a change of the line fuse and a tube change and everything was up and running again. According to Mike Allen, the internal structure of the KT88 is quite fragile, and if a set of tubes survives the first 30 days of use, they should last years. While I loved the sound of the JD-502B with KT88s, I couldn't live with the reliability issue of the KT-88's and substituted a set of Sovtek 6550's for the remainder of the review, where they performed flawlessly. "On the KT 88s, the shipping damage is usually caused by the weaker grids getting minute cracks due to shock. Now, this shock is different than vibration. It is (from) dropping the box six feet. So as you turn the amp on and off, the tube gets hot (then) cold, the grid experiences expansion (then) contraction, and a short circuit starts to appear. You can even turn the amp off and the grid on the tube will anneal and it can work again for a short time period. The 6550 is an industrial version of the KT88. Does not sound as good but, it is certainly tougher than the KT88." While both amplifiers exuded a warm, engaging and very enjoyable sound, the differences were in how the JD-502B conveyed the total sonic picture versus the JD-302B. The JD-302B had a certain musical purity that the JD-502B did not. I found the differences especially apparent during more "simple" performances, such as acoustic folk and chamber music. The JD-302B seemed better able to convey the sonic flavor of individual instruments and, especially, female vocals. Even though the JD302B was superior in this regard to the JD-502B, I actually preferred the latter. There were two main areas where I found the JD-502B superior: bass response and timing. I listen to all kinds of music, not just mellow acoustic pieces and chamber music, but also large symphonic pieces and much rock and roll. Without excellent bass response, I feel that "larger" performances come across as if they are "cut off at the knee" for want of a better term. Additionally, the JD-502B seemed better able to "lock on" to the pace and rhythm of more complex pieces, making them more enjoyable (in my opinion) than the JD-302B. In comparison to my Audio by Van Alstine Super PAS4iSL Preamp/ Harman Kardon Citation amp setup, I found either of the JoLidas more musical, mellow, and satisfying. The AVA/ H/K setup was more clinical, and probably more accurate, at the expense of musicality. Where my normal setup excelled was output power (not a fair comparison: the Citation 22 is rated at 200 watts per channel continuous.) Additionally, solid state designs do tend to control woofers better than do valve designs. I previously mentioned that all things hi fi are a compromise. There is a trade off for the advantages of the solid state power amp: in this case, I lose midrange sweetness to the JoLida amps. I attribute this much more to the Citation then the Super PAS4iSL. Both amplifiers were very quiet during use, no buzzing, crackling, or the like. If I were choosing between the two JoLida offerings, I would recommend making the choice based on two criteria: what types of music that will normally be played, and existing speakers. I sent Michael Allen a check for the JD-502B, which will reside sometimes in my main system, sometimes in my second system. Well done!